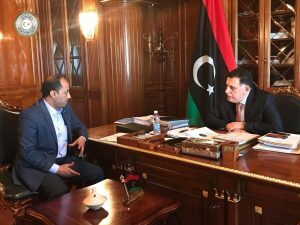 In surprise move, the acting mayor of Tobruk has been in Tripoli for talks with Presidency Council (PC) head Faiez Serraj. The discussions focused on the municipality’s budget and the lack of funding. Ali Saghir explained to Serraj the major problems Tobruk is facing in providing public services, particularly water and sanitation. For his part Serraj promised support as a matter of urgency, calling Tobruk municipality to maintain direct contact with the relevant ministries in Tripoli. Serraj also promised that 17 municipality staff who have not been paid for several months would receive their salaries and that proposals to establish a medical centre would be looked at. Saghir is deputising for Naji Maziq who is known to have some health issues. Significantly, Tobruk has till now loyally supported the House of Representatives (HoR) which is based in the town, and the interim government of Abdullah Al-Thinni, both of which regard the Presidency Council, Serraj and his government of national accord as wholly illegitimate. However, the Beida administration does not have the cash to fund local government. Serraj does. The decision to go to Tripoli in quest of it follows meeting in Tobruk last week of officials at which it was decided that the town’s needs were greater than political allegiances. Torbuk desperately needed money, it was said, and it did not matter where it came from. The result was that Saghir was dispatched to Tripoli. “They were very pragmatic,” one Tobruk official said. So far there has been no response from the president of the House of Representatives, Ageela Saleh, or from the Thinni government.